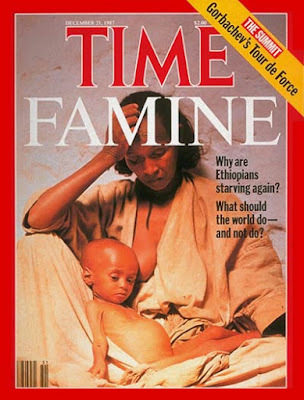 Twenty five years ago the world watched as Ethiopia suffered the greatest catastrophe ever, famine. This week marks the anniversary of the Great Famine, which claimed the lives of more than a million people in Ethiopia and present-day Eritrea. The famine, which was caused by severe drought, devastated the northern provinces of Ethiopia which includes Tigre, and Wollo. Twenty-five years later, Ethiopia is facing yet another famine. Northern Kenya, Somalia and Uganda. The drought is especially severe in Ethiopia where 80% of its 85 million people live off the land and are dependent on rain for its agriculture. The area has been hard hit by a two-year recurrent lack of rain. Twenty-five years ago, Michael Buerk's dramatic BBC footage from Korem, in northern Ethiopia, brought a devastating famine to the world's attention. Tens of thousands of people had sought refuge from war and drought in the town. The aid agency, Oxfam said that as many as 6.2 million Ethiopians need emergency humanitarian assistance due to severe drought. Other aid agencies put the figures much higher. On Thursday, October 22, 2009, the Ethiopian government made an emergency appeal for $121 million in food aid for 4.9 million people. Despite the government's claim of double-digit economic growth, Ethiopia remains one of the poorest countries in the World, and unable to feed its people. For much of the world, Ethiopia has become a byword with famine to this day. On October 22, 2009 the Ethiopian famine was a lead story on BBC World News.